368 pages - 24 x 30 cm / 9.4 x 11.8 in. This is one in a series of books to be published by Steidl that will explore Berenice Abbott’s exceptional body of work. Abbott began her photographic career in 1925, taking portraits in Paris of some of the most celebrated artists and writers of the day including Marie Laurencin, Jean Cocteau, Peggy Guggenheim and James Joyce. Within a year her pictures were exhibited and acclaimed. 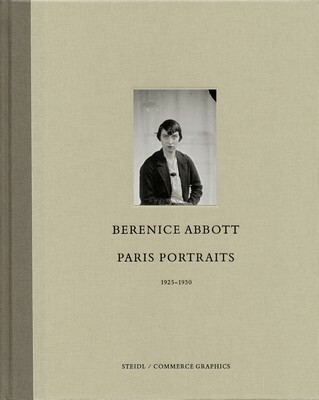 Paris Portraits 1925–1930 features the clear, honest results of Abbott’s earliest photographic endeavor, which illustrates the philosophy that shaped all of her subsequent work. For this landmark book, 115 portraits of 83 subjects have been scanned from the original glass negatives, which have been printed in full. Berenice Abbott, born in Springfield, Ohio in 1898, was a dominant figure in twentieth-century American photography. Abbott moved to Paris from New York in 1921 and in 1923 was hired by her friend Man Ray, who was looking for an assistant who knew nothing about photography and whom he could teach. Abbott learned quickly and within a year was taking her own photographs. Over the next 65 years Abbott mastered a wide range of subjects, executing the monumental project Changing New York, photographing rural America and scientific and natural phenomena, establishing the reputation of Eugène Atget, and founding the first university photography program in the United States. Steidl published the two-volume retrospective Berenice Abbott (2008), Documenting Science (2011) and The Unknown Abbott (2013).